The Noli Me Tangere by Jose P. Rizal, national hero of the Philppines, is the novel with the greatest impact on Filipino political thinking in the 19th and 20th centuries, as well as the widest influence on contemporary fiction, drama, opera, dance and film. Its popularity was rooted in its relection of the times in which it was written, and has continued because of the characters Rizal created, set in situations that still ring true today. Rizal finished the Noli in 1887, and published 2,000 copies in Berlin. Many thousands more have since circulated, in the original Spanish, and in translations into German, French, Chinese, English, Filipino, and other Philippine languages. The best known translations in English are those by Charles Derbyshire (1912) and Leon Ma. Guerrero (1961). In this new translation, Soledad Lacson-Locsin, a bilingual writer, has restored the unpublished chapter about Elias and Salome, as well as the whole of the “Canto de Maria Clara,” wishing her translation to be a faithful rendition of the original. Noli Me Tangere is a revolutionary book by our national hero, Jose Rizal, and is said to spark the revolution against the Spanish rule in our country. This was areal required reading book for Filipino high school students so I was able to read this book for our Filipino class. Or at least, I was able to read a condensed version of this book, since our textbook back then contained summarized chapters with discussion questions (which we have to summarize yet again and answer). We were also required to watch movies related to the book (and the author), as well as watch a stage play and produce our own in high school. So I was really, pretty much saturated by this then that I felt that I had no reason to read it again. I remember liking it very much in high school. A few years later, when I was getting serious with reading more local fiction, I realized that I haven’t read the full text of Noli MeTangere. Because I was ambitious like that, I said that I would read it in its entirety someday. I planned to read it last year but gave up after the first 100 or so pages. ^^; Then the opportunity came again when it became our book club’s book of the month for August, so I thought: this is it. I thought I would be able to read it easier now, given that I’ve been venturing out of my reading comfort zone lately. Of course, I was wrong. 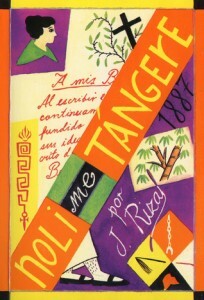 I don’t know if I was just simply busy, but Noli Me Tangere proved to be a difficult read. It was easy for the first third or so, but I lagged so much after that I wasn’t sure if I could finish it. Then I got past 400 pages, and I realized that there were about 50+ pages of appendices that didn’t count in the total story, so it was just 150+ pages before the end. I powered through and finished 3am on the day of our discussion. Buzzer beater! To cut the long story short: as a piece of fiction, I didn’t see Noli Me Tangere as a really good book. It had a lot of good moments, but half the time, it was kind of dragging. There were a lot of chapters where nothing really happened except the people were talking about what just happened in the previous chapter — gossiping characters, which is actually a very Filipino trait, but it felt like fodder in the story. The main characters were a little one-dimensional, and I wonder why I actually liked reading about Crisostomo Ibarra back then when he can be so…boring. Maria Clara was far from the strong female character that I liked reading in my books, and in fact, I liked her best friend, Sinang, more. There was some kind of hope in Padre Damaso, who showed a bit more depth in his character, but it wasn’t until the very end. Saying these makes me feel like I’m a bad Filipino, eep. :| But it’s not that it’s a bad book — Rizal is a talented writer and I liked several parts of the book for its descriptive but not purple writing. I really ended up still liking the book in the end, despite the struggle. Maybe I was just really busy for August that’s why it was hard to read? But I figure there may be two other reasons for this: first is that even if I first heard of the story 11 years ago, it was still too close to my schooling years that reading it again still felt too academic and I can’t get out of that mindset. Another is that…perhaps it’s just not really my kind of book just yet. I appreciated this rereading mostly because we had to read a highfaluting, uncondensed Tagalog edition in high school. Plus we had to read both Noli and Fili (in full) in the same year, then Amado V. Hernandez’ Mga Ibong Mandaragit the next year. Talk about nosebleed.